If there’s one thing you should know about me, it’s that I am a film aficionado. And, if you ask me, there’s nothing like a good old-fashioned classic film. You could say, that I am a self-proclaimed expert on the films of yesteryear. And because I’m feeling generous today–and because summer is just about halfway over, yikes!–I am sharing with you my must-see summer film list. Trust me, if you haven’t seen all of these by now, then, be sure to add them to your Netflix queue today! You’ll be glad you did. Sandra Dee and Troy Donahue. It doesn't get any better than this. Gidget (1959): If you’ve never seen James Darren as Moondoggie, then you must see this! There were three Gidget films made, and each time Gidget was played by a different actress. While I personally like all three films, the one must-see is the original, which starred Sandra Dee. Light and frothy with a typically happy ending. Look for Cliff Robertson as the Big Kahuna! Imitation of Life (1959): This tear-jerker isn’t really a summer movie but it starts in summer, under the boardwalk of a New York beach. It was one of my mother’s favorite movies, so that alone should make you want to see it. And it was a progressive one at that—dealing with race, class and generations at odds with each other. In fact, if you like The Help (either the book or soon-to-be-released film), you’ll want to see this tale of a rich woman and her maid–and their children. Sandra Dee plays a teenager with a deep crush on her mother’s boyfriend. Keep tissues handy! A Summer’s Place (1959): This is one of those movies that you have to see for the theme song alone. 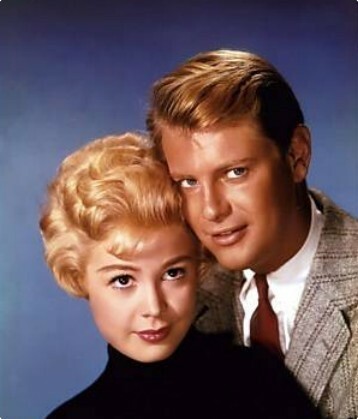 It is memorable for starring Sandra Dee with the truly handsome Troy Donahue. Together they were America’s sweethearts. Two beautiful people in love, though in this one, Sandra Dee’s mom is a frigid woman, who makes her family’s lives miserable. It’s a generational film about lust, heartache and some misunderstood kids. Did I mention the terrific, Grammy-winning theme song? The song alone will wrench at your heart. American Graffiti (1973): This film was innovative, breaking new ground in cinema and doing the unthinkable: Using actual songs that were popular on the radio, to evoke the times, instead of creating an original score for the film. This was George Lucas’ first blockbuster hit. Great cast. See it for Harrison Ford, who had a small role and who was then an unknown. Ron Howard plays a character that is reminiscent of his role in Happy Days. Dirty Dancing (1987): For anyone who has spent a summer in the Catskills, this is the movie to see and see again. The music, the ambience and Patrick Swayze’s dance moves. You know the rest. Grease (1978): Who can forget the scene where Sandy becomes a bad girl, all decked in leather, and stomps out Danny’s cigarette with her shoe? This film doesn’t star Sandra Dee but Stockard Channing does sing about her. John Travolta still sets a lot of hearts on fire with this one. Where the Boys Are (1960): More teen angst from the 60’s. This has nothing to do with summer. It’s about teens gathering in Ft. Lauderdale for spring break and passion running amok, but I love its summer feel. Connie Francis makes her debut in this flick with a torch-sounding song by the same name as the film. Where the boys are, indeed. Rear Window(1954): Grace Kelly only made a handful of movies before marrying her prince, and leaving Hollywood forever. This is one of her finest. Alfred Hitchcock’s summer in New York story also stars Jimmy Stewart in a leg cast up to his hip. He cannot move, so he spends his time spying on his neighbors. You can feel the heat of summer, as much as you can feel Miss Lonelyheart’s pain. You don’t know Miss Lonelyhearts? Then see the movie. And see Thelma Ritter at her New York, acerbic best. The Seven Year Itch (1955) Billy Wilder’s film starring Marilyn Monroe, set in the summer heat of New York. Not one of my greatest flicks of all time, if you ask me, but one you should see to understand the full breadth of the era. Famous for Marilyn storing her undies in the ice box and standing over a grate as a subway train passes. Jaws (1975): What’s a summer without a thrilling movie? I read the book but this was one case where the movie was hands-down better. I can still hear the first bars of the Jaws theme song, and it still gives me chills. Cheaper by the Dozen (1950) Not the one starring Steve Martin and Bonnie Hunter. 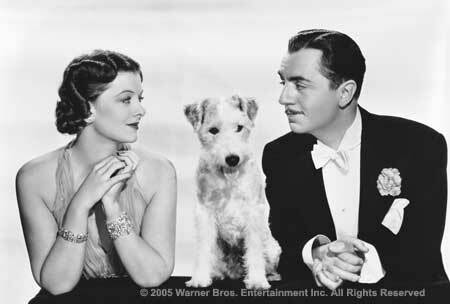 I’m talking the original with Clifton Webb and Myrna Loy. A fun, old-fashioned family movie, where dad is the patriarch and kids are respectful of their elders. And the teen daughters must wear bathing suits that cover their entire bodies. Based on a true story, and absolutely charming. So, how about you? Any summer films you’d like to recommend? Want to know the latest development in the movie industry? I’m talking bigger than all eight of the Harry Potter films. Bigger than the latest boy wonder, Ryan Reynolds. Yep. Have you been to the movies lately? Well, I went this week and all I can say is, wow! The whole world of movie-going is changing, and if you ask me, it’s about time. Because I’m pretty sure I had something to do with this gee-whiz-awesomely-new advancement in movie watching. Friends, a theater like this does not happen by accident. Clearly, someone was spying at my window and saw how, these days, I prefer to watch movies at home instead of going out. I mean, who wants to tackle the lines, the annoying crowds, and the need to arrive early just so you can get a good seat and not get stuck in the first row where you can develop a crick in your neck from having to crane it for the entire film? Who needs that? The concession stand. We ate Coconut Shrimp and homemade potato chips, freshly baked. On the other hand, what can be cozier than staying home and watching a film all cozy in your recliner, while wrapped in a blanket and eating your favorite snack—or sipping a glass off wine? After all, it’s so much relaxing at home. You can get in your jammies, pop in a DVD and voila! Instant movie theater! No crowds, no fuss, no muss! Of course, the downside is, at home you don’t get to see the first-runs–the blockbuster hits, as well as the smaller independents, when they’re newly released. You’re seeing films that have been out for a while. 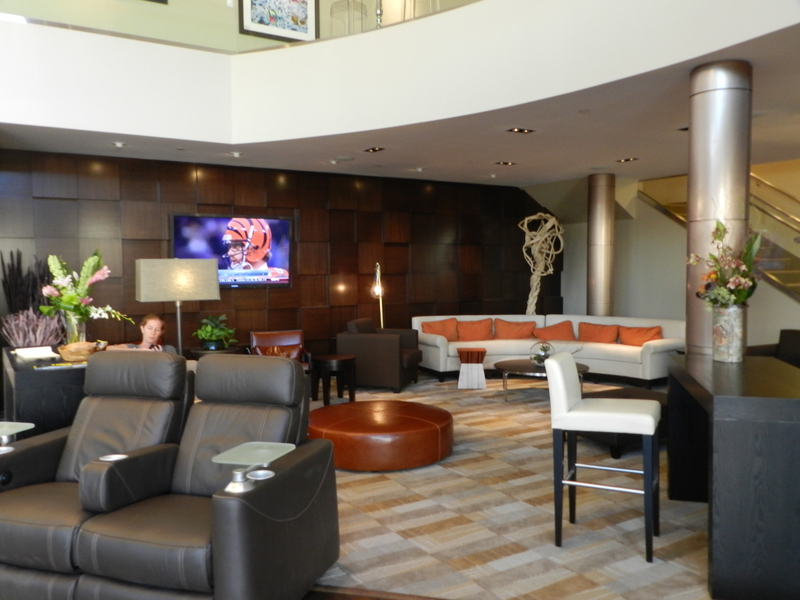 The lobby area is designed to be a gathering place--to see and be seen. So whoever was snooping, clearly took the best of watching at home and the best of theater going, and the result is the ultimate in movie-going luxury. So, now you can have your cake and eat it, too! Welcome to the future. 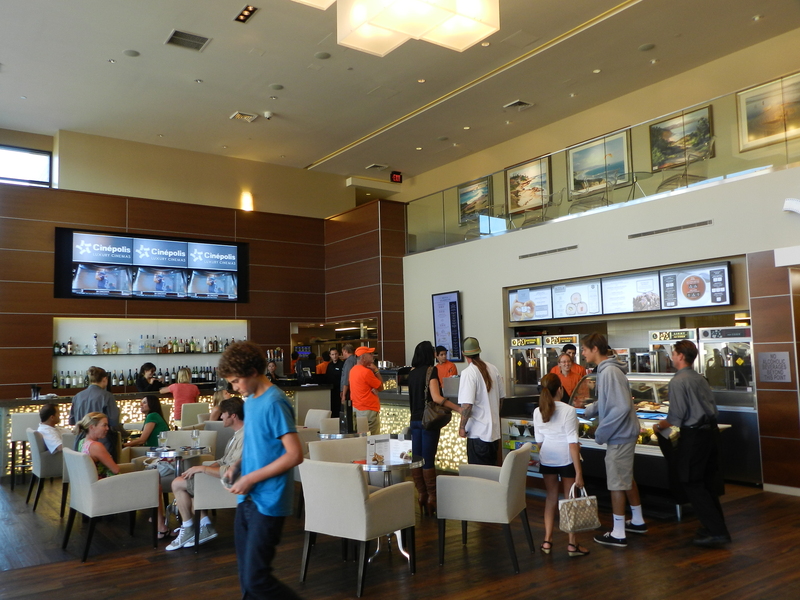 Welcome to Cinépolis. My kids joined me for a showing of Harry Potter and the Deathly Hallows, Part 2. Check out those seats! 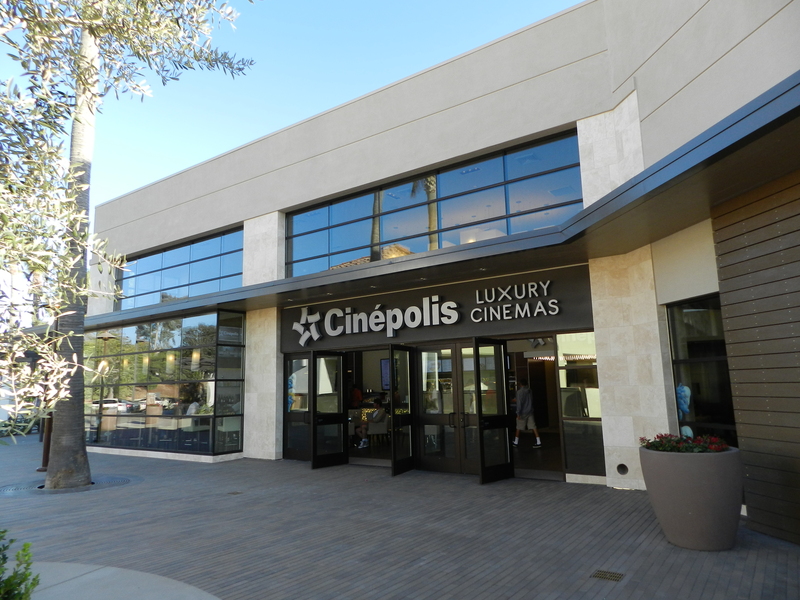 Cinépolis gives you the best of home viewing while putting you smack in the lap of luxury. If you ask me, it has brought the comfort of home viewing to a whole new level! Consider these accoutrements: Reserved seating in your very own leather recliner. Private screening feel, with theaters averaging a mere 70 seats. Push a button and a waiter comes–discreetly and unobtrusively–to your seat to take your order. Fine dining (sushi, sandwich wraps, specialty desserts and more), as well as more traditional movie fare (popcorn, served in cones, and malt balls). The only thing missing is a blanket for your lap! So look for a Cinépolis coming soon to a theater near you. And when it does, be sure to check it out. Oh, and expect to drop a small bundle, too. It’ll cost a pretty penny, but it’s so worth it! Until then, I hope my photos do the experience a modicum of justice. 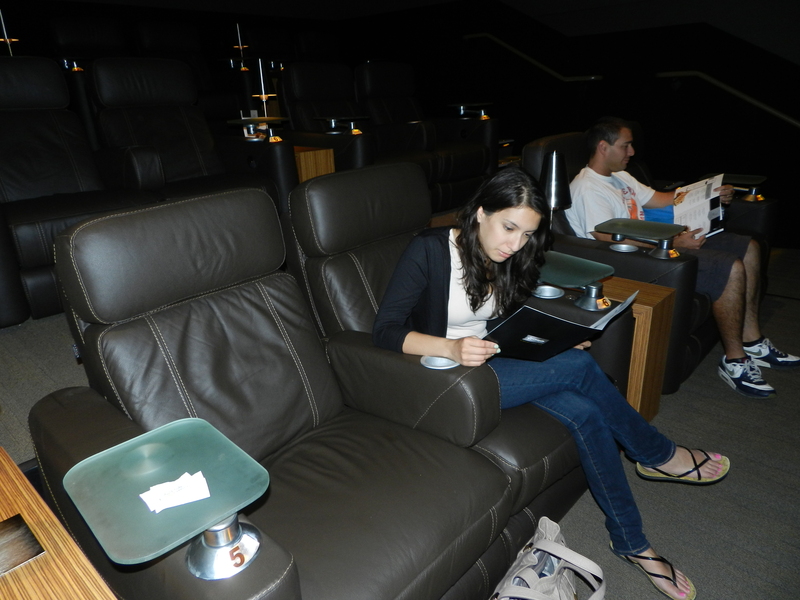 The entire theater has a sleek, well-appointed look, complete with hardwood floors and dark wood paneling.